bilaal14, don grahamleone, cbs1507 and 2 others like this. 118 of 122 points are scored in the paint, on FT, and on 3PT! Jake Tower, TracywtFacy, Handles and 10 others like this. He's absolutely right. Utah would be better by simply being in front of James and fighting through screens. All James saw was a clear path to the basket. Had his floaters fallen or the refs called the blatant fouls on Gobert, he would have had 40 points. Rubio just let him blow by. Coach Quinn didn't adjust at all, even though the Rockets kept scoring within 3 feet of the basket. Even Gobert was angry with the coach and his team for not helping out. He couldn't decide to stay with Clint or challenge James' shot. He can blame that on coach. Still, I see the Rockets winning in 5 AND I see the Rockets winning in 6 against GS. This is CP3's redemption of his career. eric.81, arubato, OtisHerrera and 57 others like this. RocketsPower, DavidRocket, UTSA2step and 13 others like this. utah completely abandoned what they do as a physical defense and went with something they don't do like at all. That's exactly what a team with no identity does. Jake Tower, TracywtFacy, chadyang and 5 others like this. Rubio just let him blow by. Coach Quinn didn't adjust at all, even though the Rockets kept scoring within 3 feet of the basket. Raider17, clutchdabear, King1 and 22 others like this. If only this were 2020 and we had the one guy from GS who's going to listen to offers from his buddies in Htown, we'd be creaming the Jazz from all over the court lol. Ummm did you just insinuate KD was a possibility? BigMaloe, Game7, Joshfast and 3 others like this. c'mon @Codman lol you can't just slide in stuff like this without giving us more juice. BigMaloe, UTSA2step, Game7 and 3 others like this. Seriously, this is just absolutely bananas. Bonkers. Idiotic. Choose your adjective. Sh!t like this is why I laugh whenever someone tries to tell me Quin Snyder is a brilliant coach or that Ricky Rubio is a great defender. don grahamleone, Patience, D-rock and 1 other person like this. Yep that "defensive scheme" is absolutely pathetic. 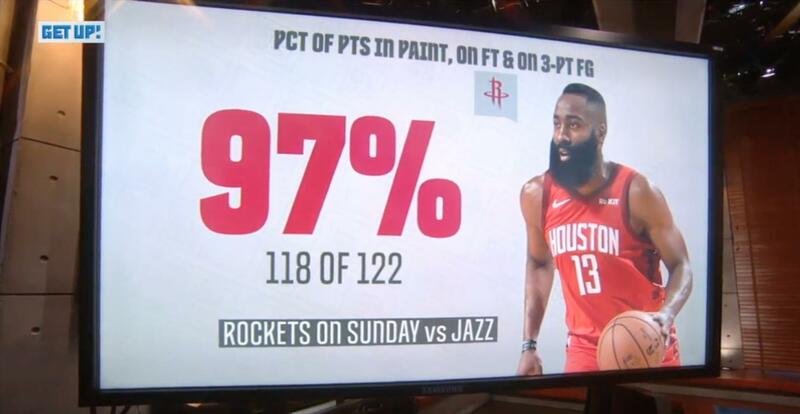 Harden is extremely good...but damn you have to at least try to stop him. D-rock and YOLO like this. and agree on rox in 5 here. but i just don't see the league office allowing GS to go out so quickly, they would be leaving a lot of tv money on the table for rounds 3 & 4. i also feel like we're at an even larger disadvantage offciating-wise with meeting GS in the 2nd round as opposed to WCF. because the 2nd round has such a smaller spotlight and is less scrutinized. no one is going to witness or notice the rig. this actually happened to NOP last year in game 2 vs GS with a FT disparity of 27-9. NOP absolutely should have won that game if not for a shamelessly blatant rig job, which was actually on par with our games 6 & 7. but because it was in the 2nd round, there was barely a whimper about it (unlike all the tweets from players/media the last 2 games of our series). Handles, BigMaloe, UTSA2step and 4 others like this. Someone posted on social media that this is pretty much what Utah was thinking for their defense. "You can't use your stepback if I'm already behind you"
RockingRox, Jake Tower, TracywtFacy and 7 others like this. Ah I see Codman is starting his “insider” nonsense again lmao. And people still fall for it every time. It’s amazing. I want to thank OP for the vid (don't listen to tinny). Honestly I was kind of half asleep during the game last night--and the blowout didn't help that condition. I kept seeing folks in the game thread refer to the gimmick defense and wasn't awake enough to pick up on it. The video helped. Whereas last night I just thought the Jazz defense sucked, now I know it was intentional. UTSA2step, beardsanity713, slothy420 and 1 other person like this. Richard Jefferson, bruh, it already DIDN'T work. You're proposing a hypothesis after the experiment already confirmed the results. Remlap, PeteChilcutBoss and D-rock like this. Talk about fearing a player. Never in my 28 years of involvement in the game have I seen a professional team completely sell out for one player. Reeko, DavidRocket, BigMaloe and 7 others like this. BigMaloe, Game7, juanm34 and 2 others like this. Letting us play 5 on 4 is girls middle school basketball stuff... it's what you'd do if you were trying to ensure a high lotto finish. Blurr#7 and D-rock like this. Yeah, I got to watch MJ and this is the closest I've seen a team completely sell out to stop one player. Pretty crazy. Nook, Blurr#7 and D-rock like this.